Introducing Captain Earle's Tobaccos at The Pipe Nook! I'm very happy to announce that The Pipe Nook now carries all 8 of Captain Earle's fantastic tobacco blends! Captain Earle's Pipe Tobaccos were created by Jay and Louise Jones of Hermit Tobacco Works. Since Jay's passing in 2011, Louise has partnered with Cornell & Diehl to bring these popular blends to more pipe smokers than she could on her own. These blends were inspired by Jay and Louise's acquisition of an antique meerschaum pipe that was owned by Captain James A.M. Earle, who was most notably Master of the Charles W. Morgan, a whaling vessel built in 1841 in New Bedford, Massachusetts. The Charles W. Morgan is the very last operational wooden whaling vessel in the world from an American fleet that once boasted more than 2,700 ships, and is currently harbored at the Mystic Seaport Museum in Mystic, Connecticut. This is a very unique line of tobaccos in the marketplace, as they are all non-aromatic, with no added flavors. Every one of these wonderful blends is comprised of very thin ribbon cut (nearly shag) tobaccos, pressed into easy to handle crumble cakes. The shining star throughout these blends for me is the interplay between the Orientals, which are present in every single recipe, and the other constituent components. Most blends feature Latakia, and many contain Perique, making for a wide range of flavors to explore! Captain Earle's Tobaccos have become one of my very favorite lines in a very short time, since I discovered them for myself, and I'm very happy to present them to my loyal Pipe Nook customers! Dunhill is one of the brands that I initially wanted to carry here at The Pipe Nook. A number of their blends have been personal favorites of mine, and it is with a touch of sadness that I announce that at The Pipe Nook, we are coming to the end of our stock of Dunhill tobaccos. British American Tobacco announced near the end of 2016 that Dunhill tobacco production would soon be coming to a close. I was gearing up to begin carrying tobacco in 2017, and this news deflated me quite a bit. Nevertheless, I wanted to carry Dunhill as long as I could, and I'm glad to have been able to be a small part in the end of the Dunhill era of pipe tobacco. BAT has very recently gone on record as stating that Dunhill tobacco production has already ceased, and this is reflected in many of their blends already being sold out at many online retailers, including The Pipe Nook. I've already removed the blends that I'm sold out of, but I still have a small supply of about half of their blends in stock. All of the Dunhill blends are excellent candidates for cellaring and maturing for many years, so I would advise that you stock up on what you can before it's all gone. While the decision for British American Tobacco to leave the pipe tobacco business seems completely numbers driven, and a cut at the heart of the pipe smoking community that the Dunhill name was built upon, I can still appreciate the blends and hope to enjoy the blends I have cellared for many years to come. And although the loss of these favored blends is significant to me, I hope you'll all take heart in the fact that they aren't the only game in town. There are so many excellent blends left out there from companies such as Cornell & Diehl, Mac Baren, Savinelli, and Peterson, that I have no doubt I'll still have plenty of fantastic flavors to stuff in my pipes. Visit The Pipe Nook for many of these blends, and all the best to you and yours! Why Do Pipe Smokers Quit? 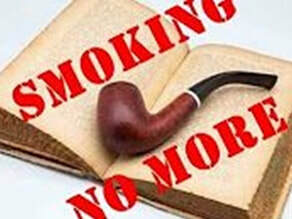 Today, I'd like to discuss some of the reasons that many who try their hand at pipe smoking often decide to quit. This is a topic that hits rather close to home to me, as I came very close to quitting before I really figured out how to smoke a pipe and how to achieve the level of enjoyment I've attained with pipe smoking. As I've mentioned before in various blogs, my great-grandfather was the one and only pipe smoker in my life as I was growing up, and while many friends and family just saw him as an oddball, or saw pipe smoking as "his thing," I was always drawn to it. Around the age of 20 or so, I decided to give smoking a shot, and I started with cigars. Eventually, I bought a cheap pipe from the drug store and tried smoking a pipe with my great-grandfather. Unfortunately, he wasn't the best instructor...he'd smoked a pipe for about 70 years at that point, but his only instruction was, "just jamb some tobacco in the bowl and light it up!" Well, that didn't really help me, so I wound up frustrated and tongue-torched more often than not. This went on for nearly 20 years...I'm not exaggerating. During that time, I primarily smoked cigars, but would occasionally drag out my pipe and give it another go. I always wanted to smoke a pipe, but just never got the hang of it. Just before I turned 40, I decided I was going to learn to smoke a pipe the "right" way, or I was never going to try again. I turned to YouTube for assistance, thinking that perhaps I would find some pipe smokers who had made videos about how to smoke a pipe. Lo and behold, there were a handful of folks, and with the help of a few YouTubers such as Jayson Dagner (The Smoking Dagners), and Kel (SmokeRingsPipeDreams), I got the hang of it, and have enjoyed pipe smoking immensely ever since. But had I not found those instructional videos, I wouldn't be here today, running a small online pipe shop, and writing about this. So let's delve into some of the reasons people give up on pipe smoking too soon. I found this to be true in my own experience. While there are techniques to smoking a cigar that prove helpful and assist in the overall enjoyment of cigar smoking, it's so much easier to get the hang of it much more quickly. With cigars, you clip the end, light it up, and you're off to the races. Cigars burn more evenly and stay lit better, because they are designed to do so. Provided they're made well, they will smoke evenly to the end with few (if any) relights. Cigar smokers who try pipe smoking will find that there is much more involved in pipe smoking: proper loading of the bowl, treatment of various types of tobaccos, the false light and true light, tamping technique, and relights. Because pipe smoke doesn't linger on your person as long as cigar smoke, I find that my wife prefers that I smoke a pipe. That's just one of the many reasons I prefer pipe smoking myself, but many cigar smokers who have an interest in pipes simply discover that they'd rather be able to just light up and go. While the vast majority of us would agree that cigarette smoking is the worst form of smoking when it comes to health risks, those who are cigarette smokers definitely have the hardest time adjusting to pipe smoking. This is largely due to the fact that cigarettes are the easiest form of smoking, and pipes are the most difficult. They are at opposite ends of the difficulty spectrum. You can grab a cigarette, light it up, and be done smoking by the time a pipe smoker can properly load his or her bowl! And when you light a cigarette, it won't go out. Once lit, a cigarette will burn itself down more often than not without you even having to take a single puff after getting it lit. This falls in line with the "instant gratification" mentality that pervades our society today. Without even getting into the health risks of sucking cigarette smoke into your lungs (most pipe smokers taste rather than inhale), or the extra chemicals that come from burning bleached white paper in addition to the low quality tobacco, I think we can all agree that cigarettes are the "fast food" of the smoking spectrum, whereas premium cigars and pipes are the "Filet Mignons" of smoking. I find that there is simply no comparison between the two, and while eating steak for every meal may not be the healthiest for you, I know that eating fast food for every meal is about the worst diet you can have. Nevertheless, if we step away from the food analogy, we can see that cigarette smoking is simply the quickest and easiest form of smoking, and those who have smoked cigarettes find that the pipe smoking ritual is much more time consuming and difficult, at least until you get the hang of it. Because of this, cigarette smokers are much more likely to give up on pipe smoking. This one also hits home with me. Two years ago, the last local brick and mortar shop that carried pipes and pipe tobaccos in my hometown closed. Because of this, there are no places left to go to be "in the scene" so to speak. There are no shop owners to provide much-needed information, or to host pipe club meetings, etc. Now, my hometown has a greater-area population (including suburbs and smaller satellite communities) of about 500,000 people. If such a population couldn't support even one pipe shop, I couldn't help but think that there are small to mid-sized towns all over the country who were in the same boat. This is what gave me the initial idea to start The Pipe Nook, with which I strive to attain the atmosphere of a "virtual brick & mortar" shop...one that provides information to those interested in pipe smoking. I try to be as helpful as I can to those who contact me with questions, in much the same way that a good local shop owner would. In much the same way that a lack of local pipe shops limits interpersonal learning, the very fact that so few pipe smokers exist these days limits an individual's chances of picking up tips from a friend or neighbor who smokes a pipe. It's very rare indeed these days to see a pipe smoker out for a stroll. This lack of pipe smoking visibility, in conjunction with a lack of local shops, is what causes many new pipe smokers to obtain their purchases, and find their sense of community, online. Which brings us to the final reason that many interested parties give up. Searching online for pipes and pipe tobaccos provides a staggering amount of choices! There are literally hundreds of pipes and pipe tobaccos to choose from. Which pipe brand should I start with? What size and shape? Should I buy a filtered pipe, or non-filtered? What is a Flake, Coin, Ribbon, cake, or plug? What's the difference between Cavendish, Burley, Virginia, Latakia, and Turkish? What the heck is Perique? It can be overwhelming, and many just decide it's not worth the effort. That's why when I started The Pipe Nook, I decided that every brand I carry would be a personal recommendation from me. I sell Savinelli pipes because I smoke Savinelli pipes. I sell Cornell & Diehl tobaccos because I smoke Cornell & Diehl tobaccos. Now, I smoke other pipes and tobaccos that I don't carry here at The Pipe Nook. But if I decide to carry it on the site, it's a brand that I feel is an essential part of the pipe smoking world today; I only carry items that I feel the beginner pipe smoker could most easily get into. I never carry anything simply from a sales perspective, and I've gotten many positive comments from customers who are thankful for The Pipe Nook both as a source of information, and as a limiter of choice in the marketplace that only carries optimal choices for those new to pipe smoking. "What Pipe Tobaccos Should I Smoke"
"Pipe Smoking 101: How to Smoke a Pipe"
"How to Smoke a Pipe Video Series from The Pipe Nook"
Please feel free to share this blog, as well as these other three, with anyone you know who would like to learn more about the incredibly satisfying world of pipe smoking! Cornell & Diehl Pipe Tobaccos Now At The Pipe Nook! Cornell & Diehl is a company that's been on my radar, and in my pipe, for some time. One of the Great American Pipe Tobacco Manufacturers, Cornell & Diehl rose from the ashes of Atlas Tobacco Company back in the early 1990's. New owners Craig and Patty Tarler worked tirelessly to build what I believe is one of the "Big Two" American Tobacco Companies. Although many of their blends are favorites of mine, many are also too strong for my taste. As such, I've kept away from the "Cornell & Diehl Question" until now. However, I've come to realize that I can't only carry my personal favorite blends, since tobacco taste is so very much a matter of individual preference. But what I can do is select particular brands that I can stand behind, and Conrnell & Diehl is certainly among them! Another scary aspect for me as a small retailer is that they have so many blends, I just can't imagine carrying all of them! Cornell & Diehl have spent the past 25 years creating a great number of top notch blends. Based in South Carolina, they currently have more than 100 blends! I'll be adding blends as I can, but will be starting with some of my favorites, as well as some popular ones, some "must try" offerings, and new items of interest as they become available. Cornell & Diehl uses some of the best tobaccos from the US and around the world to create top-notch blends, including Burleys, Virginias, Perique, Latakia, Aromatics and more! There's something for everyone in the C&D line, and I'm pleased to present what I feel is an excellent selection of them here at The Pipe Nook. I hope you agree! Weekend Sale! 10% Off Site-Wide to Stock Up for Dad! Father's Day is nearly upon us! In preparation for next weekend, I'm running a Site-Wide Sale here at The Pipe Nook. From 6/8/2017 through 6/11/2017, use coupon code "DADDYDAYCARE" at checkout, and you'll receive 10% off your entire order! Why DADDYDAYCARE? Well, I just thought it was funny. The coupon code, not the movie. I've actually never seen that movie, so you can tell me if it's worth watching! I'm running the sale this weekend to ensure that all orders received during the sale can be shipped and received in time for the Big Day. Save on Stanwell, Big Ben, Savinelli, Rossi, Missouri Meerschaum, and everything else in stock, including accessories and pipe tobacco! And if you want Dad to pick out his own gifts to enjoy, you can purchase Gift Cards in the Miscellaneous section under Accessories! I'm here at Gray Manor, back in the West Parlor (my garage), smoking some Dunhill Dark Flake in one of my treasured Neerup pipes. I just can't say enough good things about Neerup--they check all the boxes for me: looks, engineering, and that magical characteristic that I like to call "smokability." For it's part, the Dark Flake is similar to Dunhill's Flake, but is like an old friend you haven't seen in a while. He's changed a bit, has some new experiences to share, and it's a lot of fun catching up. Or to put it another way, if Dunhill Flake is your serene uncle who has a calming effect on conversation, Dark Flake is your sea dog uncle who spent some time in the merchant marines, and has a few more off-color stories to tell. But you love 'em both, and you're glad to spend some time with each of them. Today, I want to talk about a common complaint from newer pipe smokers. "No matter what I do, my pipe just won't stay lit!" When I got started in pipe smoking some 20 years ago, I had the same lament. I came from cigar smoking, and cigars just aren't as "hands-on" as pipes tend to be. Cigars are designed to continue smoking right to the end, and as long as you take a puff every minute or so, you're good. The occasional cigar may burn unevenly, but it will burn, and keeping one lit is not usually a problem. When I switched to pipes, I had the same mindset, and got frustrated to no end that my pipe kept going out. I attributed it to some sort of failure on my part, and would increase my smoking cadence to "Ludicrous Speed." What I received for my troubles was a mouth full of lava, and a pipe that still would not stay lit! Through the years, I've learned a few tips and tricks about the art of pipe smoking. Learning to pack your bowl in the "sweet spot" (neither too loose nor too tight), when and how to tamp, and how to navigate several other variables such as wind and humidity have all added to my success at smoking a pipe. But that doesn't mean my pipe stays lit from the charring light to the bottom of the bowl. In fact, that almost never happens without a little boost from a flame every now and then. In fact, I've had to re-light my pipe while typing this several times. And that's okay! The bottom line is that pipe smoking is not cigar smoking. They are very different things, just as cigars and cigarettes are very different (thank God). I would think the most difficult adjustment would be had by cigarette smokers trying to switch to pipes, since cigarettes will practically burn their way to ash all by themselves, but never really get the chance to burn out because the smoker is constantly and manically pulling that ember towards its final curl of smoke. So let's take a look at why you've come to the pipe in the first place. Is it because of the enjoyment of smoking? Or is it because you like to come to the end of things? In other words, are you enjoying the journey, or just looking for the destination? Pipe smoking has no destination aside from the relaxation it can provide, and I get there with the first puff! You have to come to pipe smoking with that mindset that the journey is the most important thing. Because the final destination is simply an empty pipe that you have to clean. Let's think about it in terms of eating. If you race through your meal, all you have to look forward to is doing the dishes, and possibly indigestion. But if you take time to chew your food, enjoy the flavors, and sometimes even set your fork down while enjoying some good conversation or a drink, the meal is much more pleasant and enjoyable. But if you're eating in a hurry, it's not nearly as nice an experience. The same with pipes: if you're constantly watching the clock and racing to the end, perhaps that's not the best time for you to have picked up your pipe in the first place. I can't begin to explain the many ways that pipe smoking has enriched my enjoyment of life. It has been a catalyst for me to calm down, take time out daily for myself, and just enjoy the little things in life. And a pipe that goes out is also one of those little things. These days, I've come to enjoy relighting as just another part of the journey. Kiribi Pipe Lighters, and New Tobaccos at The Pipe Nook! Greetings from The Pipe Nook! I'm here in the West Parlor of Gray Manor (my garage), enjoying some Gray Ghost by Cornell & Diehl in my Savinelli Impero 321. This pipe has become one of my go-to's! Practically a pocket-sized pipe, it's sort of a "matchbox" or mini version of the 320 shape, and it practically smokes itself. As for the tobacco, the Gray Ghost is a Cigar-Leaf and Virginia blend, and has really grabbed my attention lately. It straddles the line between flavor profiles of a mild cigar and a good Virginia/Burley pipe blend. Fantastic stuff! I'll be carrying it, and some other C&D blends, very soon. Today, I wanted to announce the addition of a few items I'm now carrying at The Pipe Nook, which have kind of snuck in under the radar without much fanfare as of yet. First up, Kiribi Pipe Lighters. I've always kind of cheaped it when it came to lighters, honestly. And while there's something to be said for a cheap, readily available and disposable lighter like a Bic or a Clipper, there are times when I was smoking a pipe that I wished I had a complementary lighting instrument to the quality of pipe I'm smoking. So recently, I treated myself to a Kiribi Mikazuki ($80 price range), and I've been very pleased with it! All hand-assembled with quality components in Japan, this is a sleek, well-made lighting tool, the best I've ever had by far. The flint mechanism is very smooth, the flame is excellent, and the flip-cap action is highly satisfying! In comparison, I have a much cheaper but similarly styled pipe lighter ($15 range) that I've used for about a year now, which I haven't had any mechanical trouble with; yet this morning when I meant to grab my Mikazuki and accidentally grabbed the cheaper one for a quick re-light, I was immediately concerned. "Oh, no!" I thought..."What's wrong with my Kiribi?" When I looked down and realized I had the wrong lighter in hand, I just had to chuckle. Does the Kiribi add to my smoking experience? Absolutely! Highly recommended! Next up, I've begun carrying some new tobacco blends from Peterson, including Hyde Park, Irish Whiskey, Irish Oak, Sherlock Holmes, Luxury Blend, and Peterson's Perfecct plug! Peterson blends are top-notch, and I'm very happy to have them. In addition, I've begun carrying Escudo, which many consider the measuring stick when it comes to Virginia/Perique blends. And finally, I'm proud to announce that I'm beginning to carry Seattle Pipe Club Blends, with an initial offering of Deception Pass, Plum Pudding, and the mighty Mississippi River. Excellent blends all, but the Mississippi River is a favorite of mine--complex and flavorful, yet mild enough to be an all-day blend! Thanks again for your interest in The Pipe Nook! Stay tuned...there are more good things on the horizon!